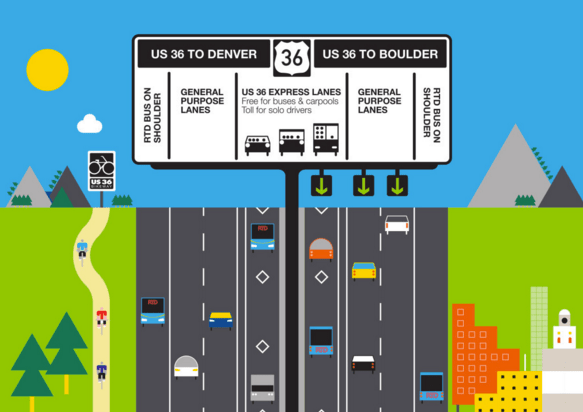 The Colorado Department of Transportation finalized rates for express lanes on US 36 and I-70 this week, and people are freaking out. The express lanes create an incentive for people to travel by more efficient means: Buses and carpools can use them for free, and to ensure that the lanes keep flowing smoothly, anyone else will have to pay a toll. The net result will be less congestion and better options for getting around without driving. Some news outlets went straight into road rage mode, framing the express lanes as price-gouging, even though they’re optional. Westword, for instance, focused on the atypical $40 maximum drivers will pay if they choose to use the 13-mile mountain express lane. Without a toll pass. During peak traffic. The typical rate will be more like $8 to $15, according to CDOT — not to mention the two lanes that will remain free. The Denver Business Journal went with the headline, “Those U.S. 36 Tolls? More are Coming,” as if drivers had no choice but to pay them. Again, the story focused on the cost of peak period tolls for solo drivers, rather than the potential benefits for everyone — less congestion as people adjust their daily routines. Sure, when the full US 36 express lanes project opens early next year, drivers could pay $16.33 per trip — if they try really hard. That’s actually just the rate to drive from Table Mesa in Boulder to downtown Denver during one hour of the day. And that’s only the cost if drivers don’t have the CDOT transponder (a toll pass), which cuts the price in half. The price will change throughout the day, depending on congestion, and will be cheaper when fewer people are on the road. Express lane prices are not unfair, they’re just jarring. The sticker shock comes from actually seeing what the use of a road is worth. Road space is limited, and if it’s in high demand, giving it away for free is a recipe for lots and lots of traffic. Putting a price on the road enables the scarce resource to be consumed more efficiently. Take the Flatiron Flyer, RTD’s express bus system opening in January, which will use the express lane and the shoulder to bypass traffic. A route runs nonstop between Boulder and downtown Denver, but the Flyer will have some local stops as well. Fares depend on where you go, but won’t surpass $4.50. Take a standard RTD bus for the local fare of $2.60. On US 36, buses can travel in the express lane, and in the shoulder anytime traffic slows to 35 mph. Carpool. Vehicles with three people — or two during off-peak hours — can ride in the express lane for free. Signs will tell drivers when cars containing two people can use the express lane for free. Bike along the continuous, paved US 36 bikeway, which will connect Boulder to Denver next year. If drivers don’t want to pay or take transit, they can keep driving for free in the two general purpose lanes. Sure, the US 36 project could be better. Los Angeles, for instance, has similar express lanes and puts 40 percent of the revenue toward biking, walking, and transit projects. That’s not the case here (nor is it what the haters want to see). The project was fast-tracked by a public-private partnership, so the financiers get a cut of the toll money. The project also would have reduced traffic more if it had converted existing lanes to express lanes, making more efficient use of the road capacity already available. Instead, it widened the road. While the project is better than a road widening without express lanes, it’s still a net increase in vehicle capacity. This is pretty mild stuff. Putting a price on roads isn’t a conspiracy to rip off drivers. It’s a way to build transportation infrastructure within our means, provide more options, and keep traffic from slowing us all down. I agree with you 100% here. The problem is that drivers have been used to “free” roads for so long that they’ve gotten a bit of an entitlement attitude. “Why should I pay to drive? Driving should be free for everyone!” And certainly a change can cause a bit of a ruckus. But the truth is that this is just price discrimination, no different than any other industry. We now have a choice. What is your time worth? Is it worth $30 to get down the hill 30 minutes faster? If so, then we now have that option, whereas we never before did. They do not want to pay for in taxes for the building of new roads and their maintenance and they do not want to pay a toll. What are they hoping for the Road Fairy to come in the night and gift us new free things? Perhaps the state can put it to the voters. Vote yes to raise taxes for new roads without tolls. Vote no and there will be toll roads. If I recall correctly (which is a bit iffy) they put that tax on the ballot a few years back and it didn’t pass, which is how we ended up here. That sounds right. It was one of the elections I wasn’t residing in CO so I am not as well versed. Thank you for this clear-eyed look at the Express lanes on 36, and for emphasizing that these new lanes are free to use for transit and carpools (HOV). Previously I believe that you, like other media, had referred to these as “toll lanes”, which gave the impression that these were to be toll-only lanes. This article nails it. Cheers to 36 Commuting Solutions, one of the region’s great TMAs, for their work on getting the word out and for developing incentive programs for drivers to try out more efficient options. They couldn’t toll the existing lanes by federal law, so always has to be added capacity that is tolled.